There are many different types of household hazardous waste materials and it is necessary to recognize what categories these materials belong in. Household hazardous waste (HHW) regularly consists of flammables, toxic materials, corrosives, and reactive materials. Improper disposal of these materials can result in environmental harm and a decrease in human health. When HHW is disposed of improperly materials can leak into groundwater, which is used for human consumption and/or environmental health. Household Cleaners: Drain cleaners, chlorine bleach, furniture polish, laundry detergent, tile cleaners. Garden Cleaners: Fertilizers, pesticides, insecticides, rat poison, wasp/bug cleaners. Devices that Contain Mercury: Light bulbs, thermometers, capacitors. Batteries: Rechargeable batteries and non-rechargeable batteries. Automotive Supplies: Antifreeze, brake fluid, motor oil, hub oil, gasoline, grease, transmission fluid wax, auto-body filler. Beauty Aids: Hair dye, hair spray, nail polish, nail polish remover. Miscellaneous Chemicals: Paint, photographic chemicals, pool cleaners, chlorine, pottery glaze, primers, solvents. Recognizing these products in your household will help you dispose of chemicals properly as well as keeping your environment clean. A household hazardous waste collection center can be found be contacting your solid waste director or local landfill. Some counties do not have a household hazardous waste collection center, in which substitution or a drop-off collection period may be feasible. For finding collection period times, contact the local city council or county government to find local drop-off collection sites in your area. Household hazardous waste collection center by US Chemical Storage provides safe, reliable and dependable containment systems. Household hazardous waste collection centers can benefit not only human health and the environment, but local counties as well. When a local county or city adopts a new household hazardous waste building, the costs savings can be tremendous. There many reasons why counties across the United States are adopting a US Chemical Storage household hazardous waste collection center, and cost savings is just one of them. Many collection sites provide scheduled pick-up times for contractors to pick up HHW, where a lot of manual labor costs are included. When utilizing a household hazardous waste collection center by US Chemical Storage, the HHW building is operating in a permanent position until it is filled up for proper disposal. There is a lot more volume in a household hazardous waste facility by US Chemical Storage, so disposal periods can be monthly instead of biweekly, depending on the amount of traffic. When purchasing a household hazardous waste collection center by US Chemical Storage, you are purchasing a HHW containment facility that will not spill or leak. Our HHW buildings are designed by professional engineers and are tested before they leave the facility for complete assurance. Constructed from heavy-duty, 12-gauge steel for superior strength and durability to stand up to the toughest conditions. 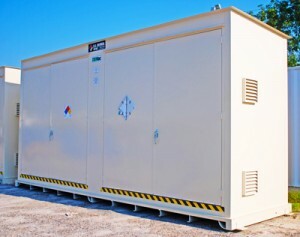 All of our household hazardous waste containment facilities are featured with a built-in sump containment for complete protection and safety precautions. Meets all EPA, OSHA and NFPA regulations – a household hazardous waste collection center by US Chemical Storage will provide maximum protection, security and compliance.